Announcing the results of 3 years of research: a PDF that will only be sold to 200 people, then it will be no longer available. 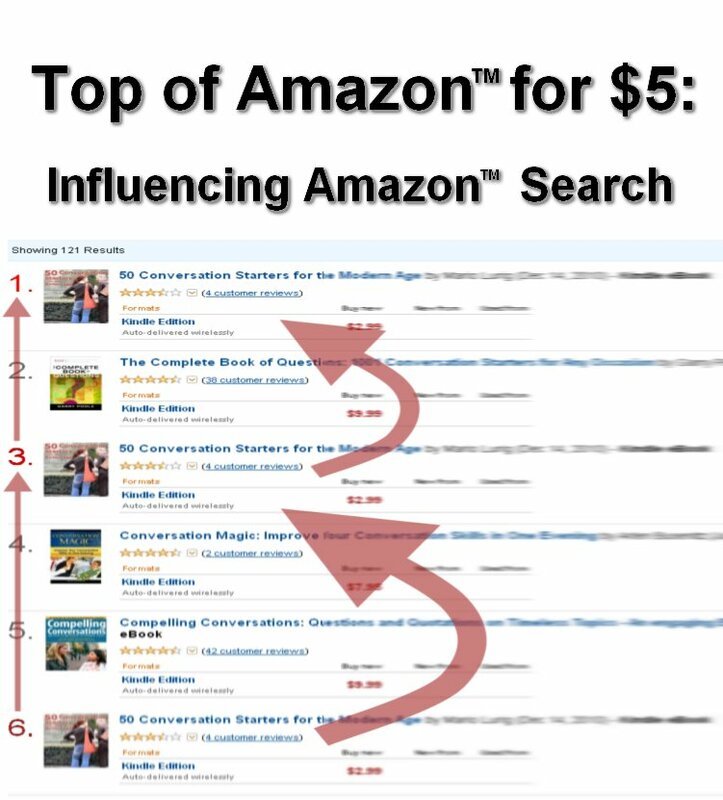 The PDF is titled, “Top of Amazon for $5: Influencing Amazon Search“. What does it offer? It provides explicit descriptions, screenshots, and instructions for an amazing way to get your product to the top of Amazon search results. This is a very big secret that will only benefit 200 people; will you be one of them? This method is not limited to books: it works for all products found on Amazon, and can be used on any Amazon site worldwide. 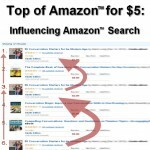 Get your product in front of the millions of visitors to Amazon every day by appearing in the top 3 of the search results! Once you learn it, you can continue to use it as often as you need. This information will be shared with only 200 people to maximize the benefit for those lucky individuals. Don’t miss out. The PDF describes a method that will not cost anything, but is most effective with a small further investment of a few dollars. It’s tested and proven to take a small investment in time and, optionally, money to rise in the search results on Amazon. There is also a 30 day money-back guarantee if you don’t find the document clear and easy to follow. Note: While this document can be applied internationally, it has the strongest value if you are U.S. based. Act now, or before you know it, the 200 copies will be gone forever. Update: A review of the PDF. This entry was posted in Research, Tips and Tricks and tagged Amazon, PDF on July 23, 2011 by Mario Lurig. Firstly, let me say that I haven’t pursued everything in the eBook (although I will definitely be doing so, with a first trial later today). I now plan to have a targeted assault on Amazon.com to see if I can push from 12 to top 3 on my number one search term. I’m very optimistic. Thanks for a great eBook. It’s well written, easy to follow and, most importantly, contains great advice! Tahir: It works for ALL products on Amazon, not just digital products. So yes. Melanie: Thanks for the positive review; I’m glad it is working so well for you! Is the method suitable only for Kindle books or does it work for regular paperback listings as well? I just wanted to say thanks. I did have doubts, and I even emailed you a few days ago…but it kicked in! Not only that, but that ‘other place’ got me into a second job on the side making a little money. :) My books that were doing zilch, have now had 6 sales in August. 6. I’m not on the top 3, but dang being on page 3 of scifi isn’t that bad! It has absolutely zero to do with ‘tips that everyone else uses’. It’s not about buying a bunch of copies of your book, slamming it with reviews, or doing $0.99 sales. I would never dare to put up for sale that kind of info (Like the MYTHS post, it would be free). It’s one fantastic secret and a method for leveraging it for either free (time cost) of less than $5 (minor monetary cost). That is also why it has the 30-day money back guarantee and of course, I’m putting my endorsement behind it, because I hope that makes you comfortable with the purchase. I love the service and don’t doubt that this information is important and relevant. What worries me is it’s the same stuff we already know – get a ton of reviews etc. At $50 it’s not worth the risk. If you think this is something that authors don’t know and is proprietary knowledge then I’m in … but give us a little more info. It’s too vague to jump into an eBook at that price point. Even if it’s a reply to this comment, that would be great. BTW I don’t expect it to be some magic button, so that’s fine. But if you just go and tell me to get a bunch of reviews and post them all in 24 hours then I’ll be bent out of shape on that one! Seen some crazy stuff and crazier promises over the last couple of years :) Bit of reassurance would be perfect. It’s a 20+ page document that tells you what influences Amazon search, and then provides actionable instructions (very clearly) that show you how to use that knowledge to raise your search rankings. There is definitely no slogging, but it is a guide, not a magic button. Most magic buttons are scams, this is researched, tested, and actionable.